IN THE MANUFACTURE OF KNIT UNDERWEAR, SWEATERS, ETC. This high speed, cylinder bed machine embodies all of the distinctive improvements of the new Singer Class 148 Machines, and is the foremost machine of its type for seam covering on knit underwear, light weight sweaters, etc. It has two needles and one looper, and makes a strong elastic chain stitch with three threads, producing a perfect overseam on all grades of knit goods, ranging from the finest balbriggans to the heaviest fleece lined goods. A large output of work is ensured, as the machine can be operated continuously at the high speed of 3200 per minute. The distance between the two needles may be 1/8, 3/16, or 1/4 inch, as desired, and orders for the machine should specify the gauge required. The machine is capable of using needles from sizes 12 through 24. Tubular and irregularly shaped articles are conveniently fed up the cylinder bed of this machine, the cylinder bed being 2 inches in diameter and 9 and 5/8 inches in length from the needles to the upright part of the arm. There is a clearance of five inches between the top of the bed and underside of the arm. Owing to the improved thread controlling mechanism which includes a rotary take-up for the looper thread, the machine will successfully handle woolen yarn. 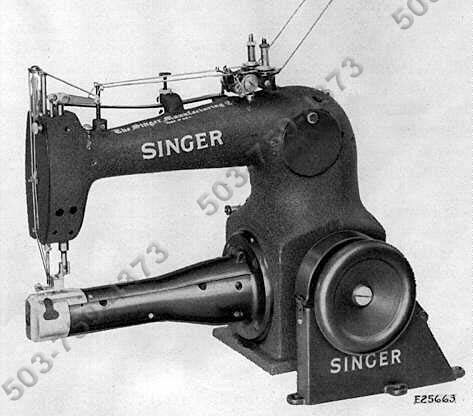 Garments can therefore be stitched on the machine with yarn similar to that from which they are made. Another feature of the machine is the mounting of the looper directly on the looper shaft, making the machine much simpler in construction and more satisfactory in operation than previous machines of its type. An efficient drop feed and compensating presser foot enable the machine to sew all thicknesses of knit goods with equal facility. 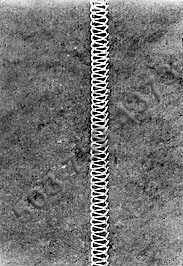 The central portion of the presser foot is stationary while the left and right portions of the foot are provided with springs which afford an independently yielding pressure on the material at each side of the overseam stitching, so that uniform stitching is assured regardless of variations in the thickness of the material being sewn. A fin-shaped guide, located at the front of the central portion of the presser foot ensures accuracy in placing the overseaming stitches over the centre of the seam. Short turns are easily made at high speed, due to the specially designed throat plate. The machine is fitted with an outside stitch regulating device which enables operators to instantly adjust the machine to make the desired length of stitch. To facilitate the withdrawal of the work, the machine is fitted with an automatic tension release by means of which the threads are automatically released when the presser foot is raised. A foot lifter is provided with each machine, for raising or lowering the presser foot, thus leaving the operator's hands free to manipulate the work. The mechanism is entirely enclosed. All parts of the machine are accessible, hinged cover plates being provided to make threading, cleaning, and oiling easy, while a removable cover plate at the rear of the machine permits the ready adjustment of its mechanism.